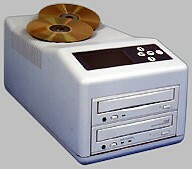 The concept of creating a standalone CD-Copier using a device to connect a CD-Reader and a CD-Writer to each other, without the using a computer, is not new. Already a few of these devices have been on the market for a few years now but they were very expensive and that's why they were hard to find. At the moment a few cheaper devices have been released which will let you choose which CD-Reader & CD-Writer you want to use. Something which was not possible before. CopyALL is a product from Media Stream. They are a company, based in Taiwan, who specializes on manufacturing and promoting CD Duplicators. The CopyALL Terminator is a device which is able to convert almost any SCSI CD-Reader and SCSI CD-Writer, upto 8x speed, in a standalone CD Copy station. The whole device is build into a very small box, which looks like an external SCSI terminator, hence the name. The device plugs in the SCSI Connector at the back of any external SCSI Casing. When the duplication process is ready a beeping sound will be heared and the two LED's on the right will indicated if the duplication process was successful or not. The device is based around an Intel 80386SX processor, a SCSI-1 interface and an 1 Mb memory buffer. It feeds itself from the SCSI Termination Power which is always present on the SCSI bus. Just press the Copy button and make a 1:1 backup of any kind of CD. For the more difficult CD's, protected or just scratched, an additional Save button has been added which enables writing at 1x speed. This should make the whole duplication process more smooth and stable. Currently the price of the CopyALL Terminator is solf for around US$ 300,-. Not very cheap at the moment but that will change when the device come more widely avaialble. The CopyALL Mobile is in fact the same as the CopyALL Terminator but it supports, next to SCSI CD-Reader, also IDE/Atapi CD-Readers. The LED bar on top indicates the duplication progress and will indicated if the duplication process was successful or not. Both CopyALL devices have a firmware upgradable flashrom which makes it very easy to upgrade the bios from a CD-ROM. The price of the CopyALL Mobile is currently not known yet. 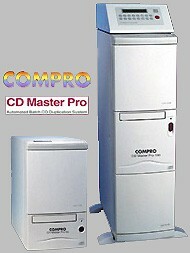 COMPRO CD Master is a product from ACS Innovations International. They are a based in Singapore. 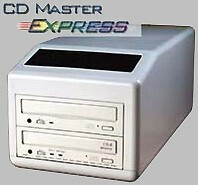 The CD Master Express is build around a Matsushita/Panasonic 8x speed SCSI CD-ROM and a 4x/8x speed SCSI CD-Writer (Panasonic CW-7502). It has a buildin feature which enables it to copy damaged CD's which are rejected by normal CD-ROM drives. The CD Master Express's Prescan feature will map out the bad tracks and pick out the useful data. 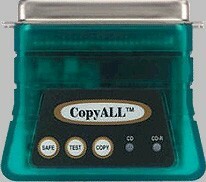 The device can also be connected to a PC or Macintosh as external CD-ROM & CD-Writer. It can playback audio tracks on CD or hard disk via its built-in speakers for audition purposes. CD Master accepts any external audio source via the audio input jacks and creates an audio CD automatically. Audio tracks from different CDs and external audio sources can be arranged and combined on one CD in a few simple steps. 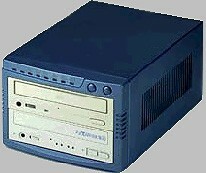 The CD Master Pro 100 is build around a SCSI CD-ROM and maximum four 4x speed SCSI CD-Writers. It can hold upto 100 CD-R's. The CD Master Pro employs CD Magazines which can hold 10 CD-R's each.